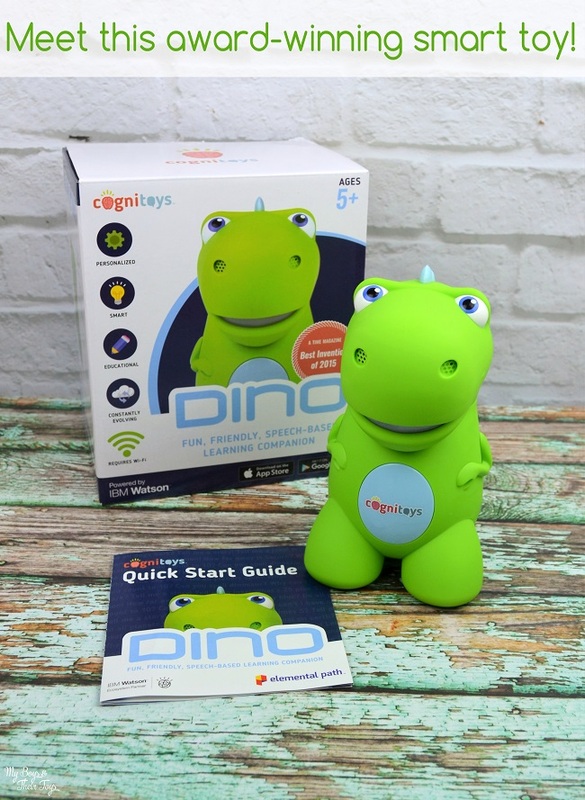 Meet the award-winning smart toy; Cognitoys Dino! 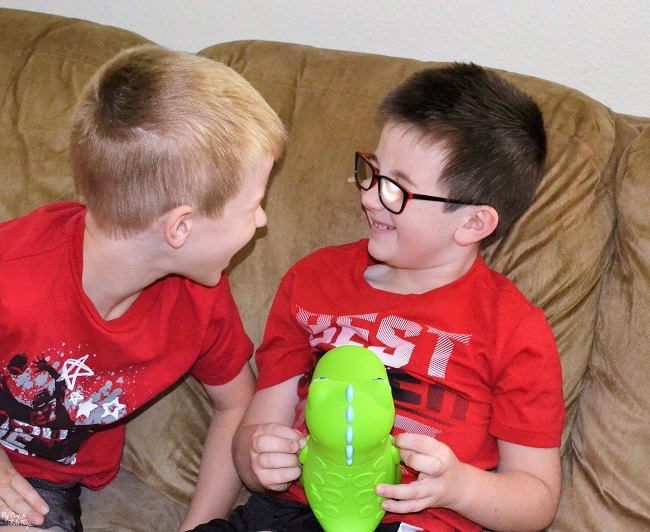 This adorable Wi-Fi enabled talking dinosaur toy is interactive, educational, and loads of fun! CogniToys are smart devices in toy form, tailored just for kids to provide an educational and entertaining experience without the need for a screen. Watch as your child’s favorite dino pal tells stories, answer questions, and play games too. Did you know kids ask an average of 300 questions a day? Thankfully this talking dinosaur toy can help! Smart: CogniToys explore a wide variety of content through interactive dialogue. Using IBM Watson and Elemental Path’s Friendgine technology, the dynamic Dinos are truly putting the “smart” in smart toy. Constantly Evolving: Cloud-connected and Wi-Fi-enabled, CogniToys update automatically as new content becomes available. Easy set-up: Parents must use the CogniToys App to connect the Dino to Wi-Fi. Once connected, the Dino no longer requires the use of a smartphone for playtime. Educational: Recommended for kids ages 5 to 9, CogniToys answer questions, tell stories, play games, crack jokes and even lead guided meditations to engage children in educational play. Because the talking toy dinosaur is continuing to evolve, your kids will never get bored! My boys have an absolute blast asking their adorable pal, that they’ve named T-Rex Awesomeness, all sorts of questions. Some of their favorite commands are interactive story time and games too. Cognitoys Dino also has math capabilities including addition, subtraction, multiplication and division. Ask your dino to play a game like animal mix-up, capital quest, dino chef, and even dino quiz to learn and play. Cognitoys Dino knows several books, just ask him to play the bee, pony or doctor story – just to name a few. He can tell you bedtime stories too like Fisherman Bob, Sleepy Donkey or Princess Sleepypants. 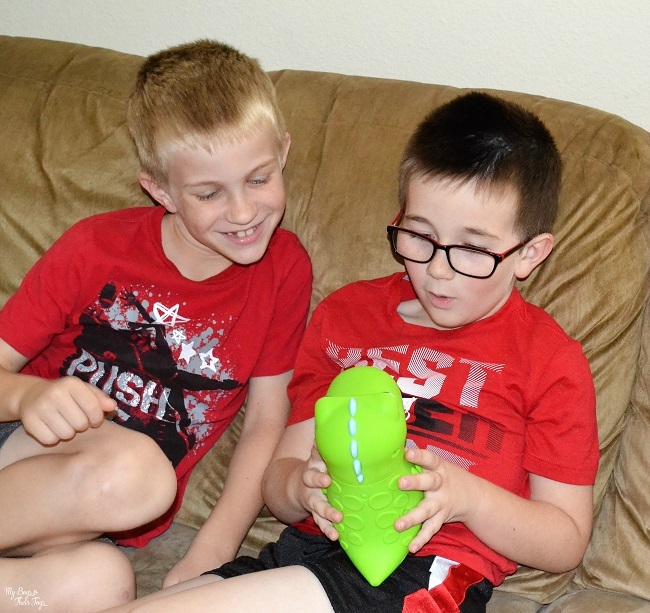 Watch your kids explore, learn, and grow with this fun interactive talking dinosaur toy! Find Cognitoys Dino at Toys R Us, Amazon and Cognitoys.com! If you’re searching for the perfect educational toy for your child – this is it! I love educational toys and this one looks awesome. So neat that it continues to evolve. That’s a pretty neat toy! So many kids are into dinosaurs & this one can answer questions & tell stories! Wow, now THIS is what I call a smart toy. I love that it updates on its own, so kids never get bored. This looks really cool. I love that it has an easy setup too so that the kids can get right to playing. This would be perfect for my son. He turns 5 in January so I’ll have to consider getting this as a birthday gift. I love interactive toys like this. I think they get played with more often than other types of toys. My son would love it for sure! This one is cool! Talking dinosaur would be so much fun! Not only is that adorable, it’s educational, love it! My nephew would love it! This is the cutest! My grandsons would love to have this! Looks fun. Love educational toys for my kids. My first time seeing this! My Joe Joe loves dinosaurs and he’s having a little trouble in reading….this may help! I like how educational this is! My nieces would enjoy it! This is such a great educational toy and my son loves dinosaurs! This would make a great holiday gift!